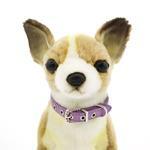 Little dogs will have big style with our feminine Bow-dacious Crystal Dog Collar in Lavender from Mirage! 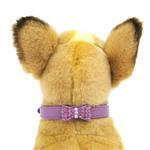 The Bow-dacious Crystal Dog Collar in lavender adds that special touch to your princess pup! 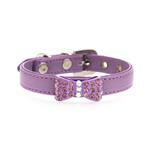 This soft faux leather collar features gorgeous crystals on both the buckle and the pretty bow. 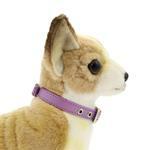 This durable yet delicate looking 3/8" wide collar is perfect for smaller to medium-sized dogs. Despite its fancy appearance, this lovely collar is perfect for everyday princesses. This feminine collar features a lavender faux leather strap and a lavender bow that's studded with Czech crystals in lavender and iridescent aurora borealis crystals that will catch everyone's eye! We love that the collar shines from every angle with additional lavender crystals in the buckle. This truly is a collar fit for your elegant princess pup. Posted On 03/09/18 by Susan G from West Lawn, PA Yes, Susan G recommends this product! This collar is lovely and the shade is great for springtime and summer. It is a dressy and narrow collar that accessorizes well with my dog's wardrobe. Posted On 09/23/17 by Jennifer S from Vancouver, WA Yes, Jennifer S recommends this product! Posted On 05/19/16 by Anna from Gaithersburg, MD Yes, Anna recommends this product! It's adorable, but I need to return it for a larger size. I actually bought it for our small cat because she's afraid of the bells that come on the cat collars. Posted On 12/09/15 by Margaret M from San Francisco, CA Yes, Margaret M recommends this product! Lovely color, well made, and perfect for my 15 lb Lhasa Apso little girl. I love to dress her up. I went online looking for white dog shirts that I could put an iron-on graphic on. Yours was the first site that popped up, you had exactly what I was looking for, the price was AWESOME and I'll have the shirts in less than a week! It couldn't get any better than that!